Manx cats originated on the Isle of Man from a population of cats whose common ancestry sprang from the same roots as the British Shorthair. A spontaneous mutated gene which carried a dominant trait occurred at some point several hundred years ago. This mutation created some kittens born without the vertebrae that form the tail of normal cats. With the passage of centuries and due to the isolation of the cats from outside breeding, the taillessness eventually became a common characteristic among the Isle of Man cats. The Manx cat was a popular, well-established breed in England long before the birth of the cat fancy there in the 1870's. Around the year 1820 the Hurley family owned a large farm and their own sailing vessels in Toms River, New Jersey. Their sailing adventures often took them far away, it is believed that on one trip they brought back with them tailless cats from England, which were said to have came originally from the Isle of Man. This is the earliest account known of Manx cats in America. The original Isle of Man Manx had longer limbs and a longer body than the contemporary Manx, but the basic characteristics were there - deep flanks, long back legs, and a sturdy body. As the breed's popularity increased in England and America, the stock on the Isle of Man dwindled. The Manx cat was an enduring symbol of the Isle of Man for centuries, today it may be dying out. Tourists from all over the world visit the island to see the tailless feline. At one point, the island's government established a cattery to ensure the tailless cats survival, interested local people or tourists could order kittens. However, the Manx government closed the cattery in the mid 1980's, believing that the kittens would be better raised in a home situation. The 19 breeding cats that resided there have been found new homes. There remains a Mann Cat Sanctuary on the Isle of Man it is located in Ash Villa, Main road, Santon. It is home to various animals now as well as Manx cats but kittens are forbidden to be sold there. There is concern over the possibility the Manx cat could become extinct in it's own home land. Strangely enough, in Great Britain the Manx is no longer an accepted breed in show competition. This is due to it's genetic mutation which is thought to be very harmful to the breed. In the United States however, due to dedicated breeders the Manx thrives and is very healthy. It competes in cat shows and is a very popular breed. The size of the Manx cat has increased, and the short-backed, broad-chested and stocky cat that we see now became the desired type. Today, few Manx cats are imported to America for breeding or show purposes, the gene pool is established and large enough this is no longer an issue. Those Manx brought to the United States now are usually the pets of English families coming to live in the United States. The Isle of Man was part of the Norwegian Kingdom of the Hebrides until the 13th century when it was ceded to Scotland. The Isle came under the British crown in 1765. Although only 227 square miles in size (roughly three times the size of Washington, DC), the Isle has many unique features that make it so interesting to visit. The inhabitants of the Isle are known as Manx. Surnames such as Quayle, Christian, Kaighin, and Clague are of Manx origin. 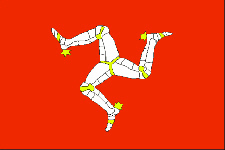 The flag for the Isle of Man features three conjoined legs, symbolic of their motto that "a Manx man always lands on his feet". The Isle of Man has the "Oldest Continuous Government in the World", dating back well over a 1,000 years! 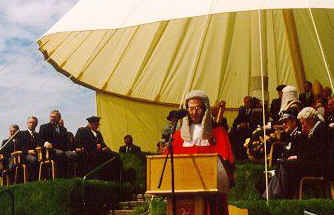 At Tynwald, every July 5th, the parliament gathers for an assembly to announce new laws in both English and the island's native Manx Gaelic. Anyone with a grievance can present their case and be heard. Self-government and independence has always been the island's tradition. The Isle of Man is a tax haven for residents, with the highest personal tax rate at about 15%. The Island also has no corporation, capital gains, wealth, surtax or estate taxes. Its constitutional stability and independence attracts investors from all over the world. The Isle of Man remains one of a handful of nations that prefers to remain independent of the United Nations. Known as "World's Greatest Motorcycle Road Race", the TT Race is a mecca for all bike enthusiasts wishing to witness this exhilerating and most terrifying of motorcycle races. The race, occurs every June, it was cancelled for 2001 because the Manx government was concerned about "hoof and mouth" disease being spread by the participants. 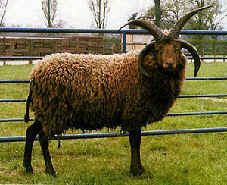 Aside from the tailless Manx cat, the Isle of Man is also home to the unique, ancient, and strange four-horned Loaghtan Sheep. For the golfer, the island has several challenging coastline links courses. For those who prefer tranquility, there are wooded glens, sandy coves, rugged coastlines with an ever-changing seabird population, mountainous moors and quaint fishing harbors. The Island has a abundance of ancient Celtic sites and numerous other interesting places to see from its long and varied history. Many stories and legends attempt to account for the Manx cat's origin and its arrival on the Isle of Man. In many of these tales, the Manx are descended from ship's cats who were shipwrecked on the Isle of Man when their ships were sunk off the coast. 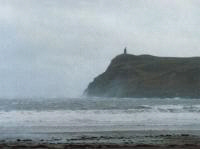 One commonly told story is the legend of two ships from the Spanish Armada that were sunk off Spanish Point near Port Erin, on the Isle of Man, in the early 17th Century. The Isle became a refuge for the tailless cats from these two ships. In another legend, the cat came from a ship wrecked in 1806 off Jurby Point, while yet another says it was a Baltic ship wrecked off Castle Rushen and Calf Island. One far-fetched story tells how Phoenician sailors brought a tailless cat back from a voyage to Japan. 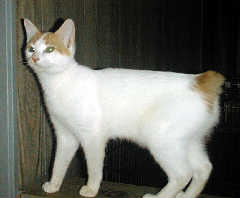 Japanese Bobtail cats have short, kinked tails and a less stocky body than the Manx. In fact, there are tailless cats in many parts of the world. Some speculate that the Manx may have originated with the Annamite cats of Burma, which have short tails. Others believe the Manx may be descended from Siam (Thailand) or Malaya. Charles Darwin reported that the Malaya Archipelago cats had kinked, knotted, and short tails. There are tailless cats in China, Russia, especially the Crimea and in many other places. Perhaps the Phoenician story has a grain of truth in that the Manx cats may have migrated to the Isle through ships trading on the coasts of the Black Sea. Some believe that Vikings may have brought tailless cats to the Isle of Man during the island's early colonization. The Welsh, in their legends, considered tailless cats to be sacred animals in early times. Cymric, the name for the long hair Manx, is derived from an ancient name for Wales. British folklore tells how a female cat bit off her kittens´ tails to prevent them from being slaughtered so that Manx warriors could wear their tails as helmet plumes. In another story, the Manx was late in reaching Noah's Ark and Noah, eager to set sail as the waters rose, the door slammed shut and cut off their tail. Since many trade ships docked on the Isle of Man, and all had ship cats, it is hard to tell just what the original Manx cat really was. Obviously, the original mutation was present in both longhair and shorthair cats. Many longhairs live on the Isle along with the shorthairs. Records on the Isle of Man describe the cat as a mutation of the island's domestic cats. While most agree that the island cats were involved, some wonder whether some of these island cats had actually come off of ships. Note: All images and content are copyrighted by Karen Slemmer, Karello Cattery, individual photographers and designers. No part of this web site may be reproduced in any form or by any means without prior written permission from Karen Slemmer, photographers or designers.